I must apologize to my follower for the lack of content over the last several (yikes) weeks. I have spent my exile in the silent wilderness beyond the edges of this blog stalking that ever elusive pray... a job. Also, Sveta and I have moved into a new apartment. Naturally that whole process has taken a lot of time. Good news, though-- I'm going to get my own study! Anywho, I have managed to get some things done, so look out for them over the next few days. In the meantime, I find that the projects I want to do are starting to multiply in my head-- to the extent that if I don't put them down I fear they too might be lost to the silent wilderness. 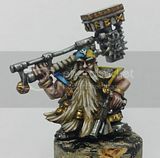 Assemble, sculpt, and paint the Axe-Pick Murphys (dwarf team). Get my hands on some Mantic Games elf scouts to convert into a high elf team. Finish my custom Bloodbowl Pitch. Pre-register for the Chaos Cup and book a hotel room. Make a couple of warbands! This will include a lot of sculpting. Make some scenery-- this will include more trees, some hills and rocks, ruins, a couple of magical objectives, and some treasure/item tokens. Come up with my own setting, compatible with my skulldred setting. Get a job, make some money to buy ingredients, and brew some dang beer. Oh yeah, and move all of my equipment from my old apartment. Ugh. Aside from all of this, I've been thinking about ways in which I might be able to design a multi-system, multi-scale narrative campaign incorporating Skulldred, RSBM, Warmaster, and maybe even some dungeon crawling. I think I could make a pretty awesome and engaging story this way. But that's a long way off and a lot of thinking from now. If you're reading this, leave a comment on any cross-system campaigning you've done, and what you thought. Or just leave any old comment. I should probably just start by playing a campaign in each of these systems separately. That in itself will take some time. And on that note, I must away! There is much to do!